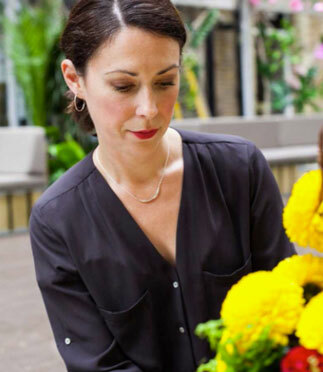 As florists buying from London’s biggest flower market, at Hybrid, we know for certain when winter is on its way when we spot the Dutch flower trollies neatly stacked with slim, yet surprisingly heavy, rectangular boxes full of an indispensable floral hero. Like children opening long-awaited-for presents, we feel a genuine sense of anticipation and awe as we lift the cardboard lid to one of these boxes. Similar to a box of toy soldiers from another era, we are met with rows of individual stems: fresh green, chunky, and topped with full-to-bursting buds of giant flowers resting on pillows of foam. And we rejoice! Our beloved amaryllis has returned! 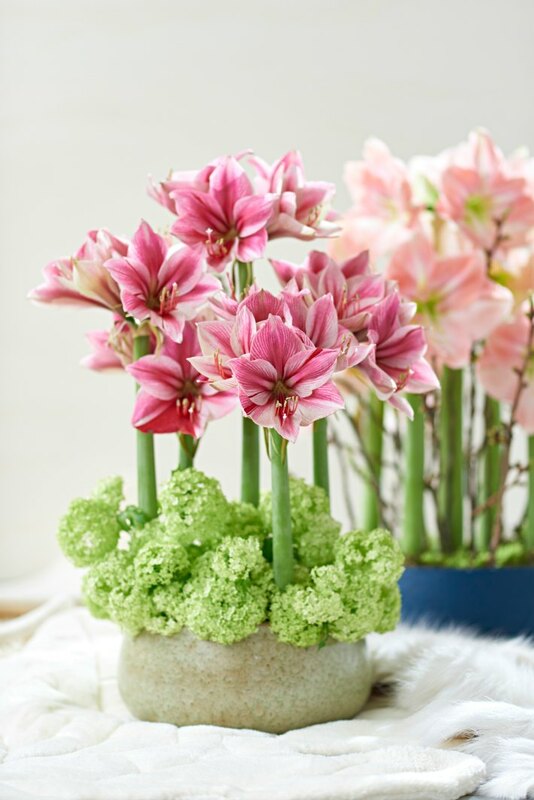 Without a shadow of doubt, the amaryllis is up there as one of the top two “Florist’s Life-Saving Winter Flowers” (and yes, that is a Thing). We looked at its partner, the cymbidium, in an earlier post, but for this piece, my aim is to create within you the same sense of wonder, respect and admiration that we feel towards the amaryllis. I shudder to think where we would be at winter time without these beautiful, powerful blooms. To create something spectacular, you need the best, most versatile materials you can find and the amaryllis come up trumps here, giving us the option to use their amazing height and presence to create real impact. We have positioned them in giant fan-shaped vases for high-end hotel lobbies and bound together in ‘wands’ to look like a giant lollipop, which is perfect for corporate reception areas. 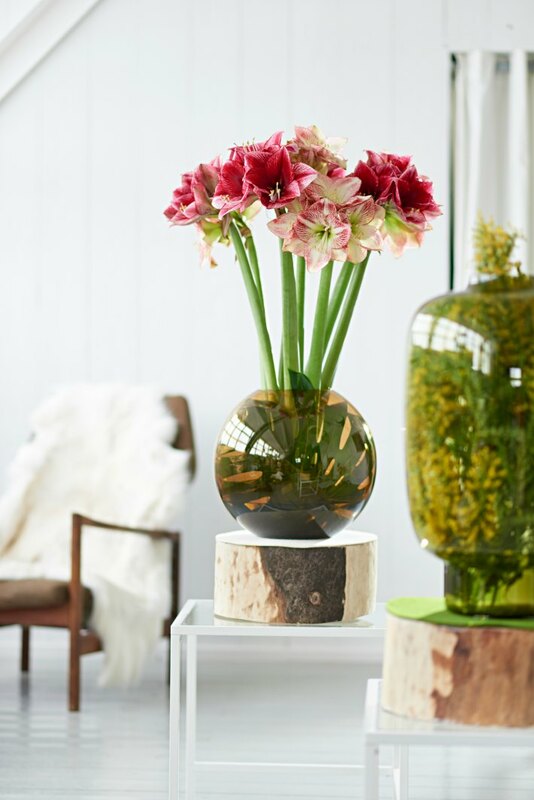 Their magnificently bold open blooms look fabulous used completely on their own or when placed alongside other winter and spring flowers set into all manner of simple or striking vases and vessels. 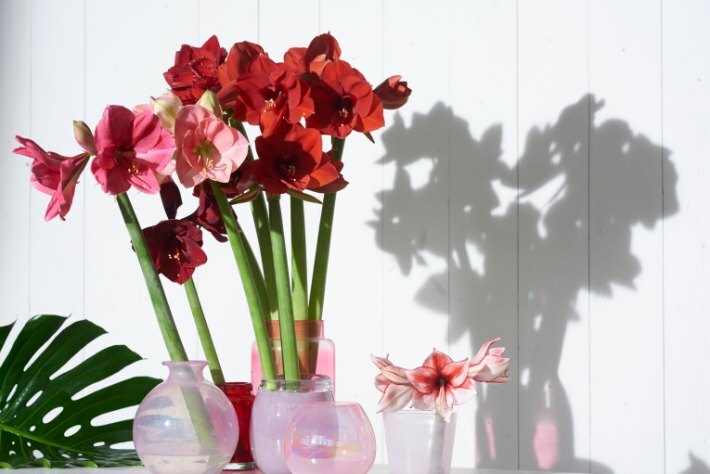 With colours ranging from the purest of whites to the most shocking of candy pinks, with oranges, peaches, reds and almost-blacks, in between, the amaryllis ticks all the boxes. 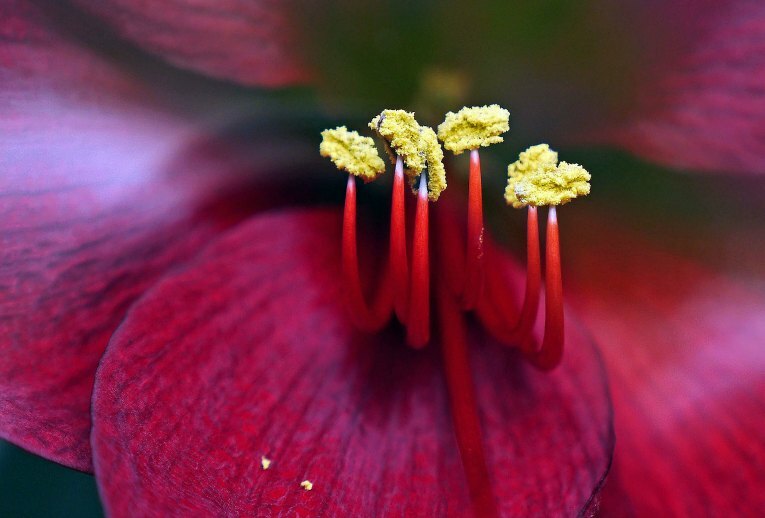 Why do we think of amaryllis as a winter flower? 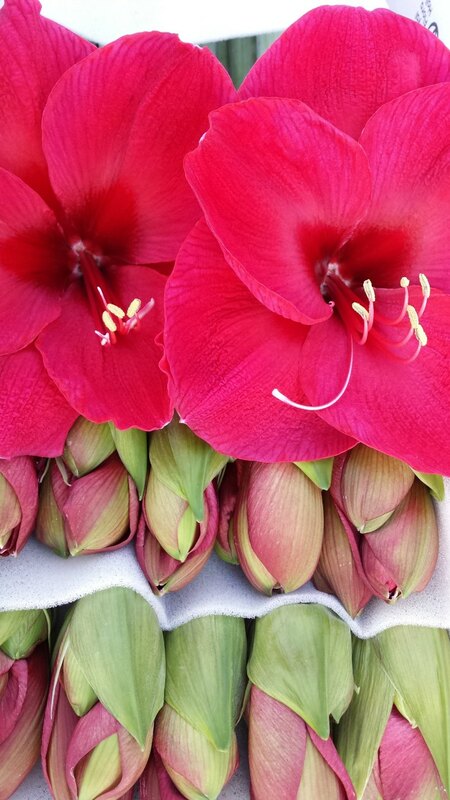 Years ago, most amaryllis were produced in November and December because the flowers were only used at Christmas time. 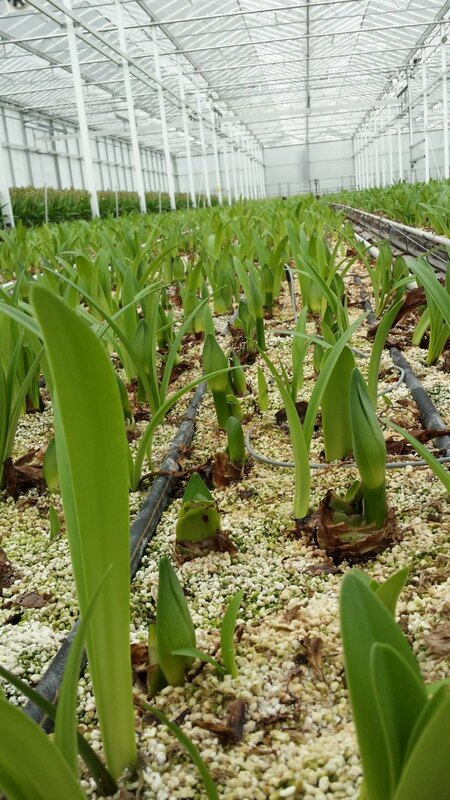 An amaryllis bulb will stay in our glasshouses for the whole year and, a bit like tulips in the garden, bulbs will only flower when they have been kept for two months at a temperature below 15 degrees. 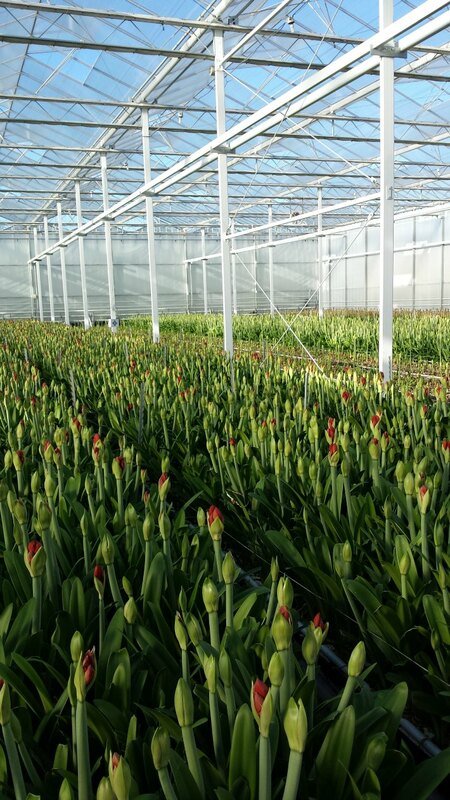 One bulb can grow two or three stems within a year, so we have 6 sections in the greenhouse, each with a different cooling temperature. 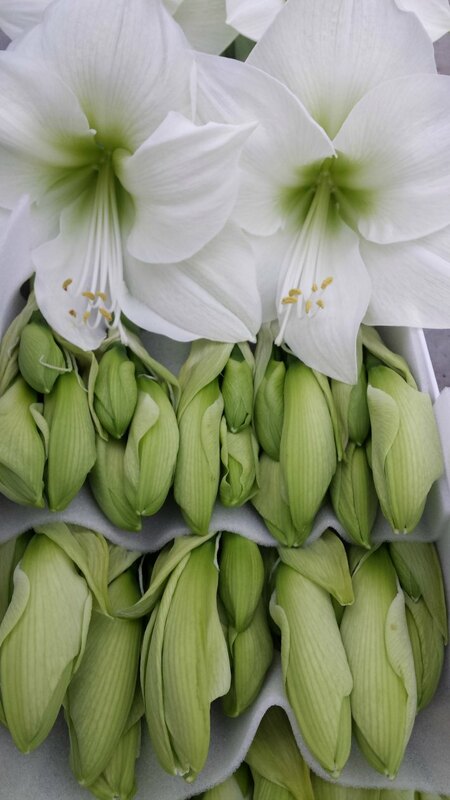 This enables us to produce amaryllis from September until March. 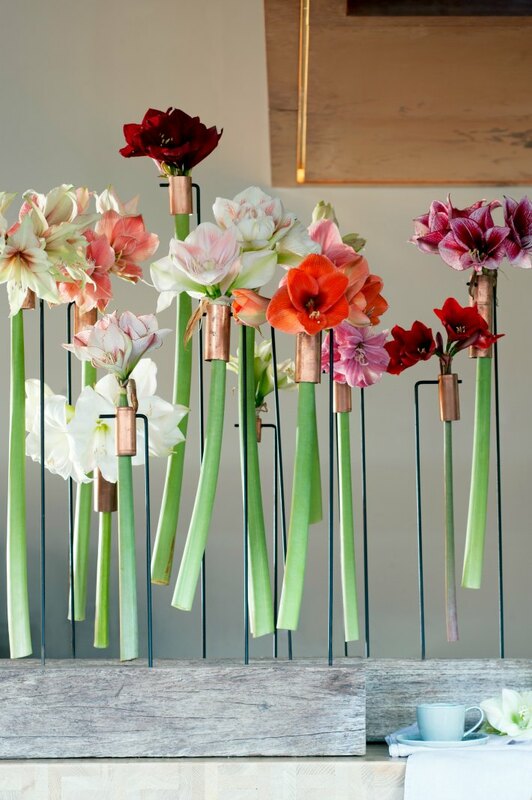 Just how popular are amaryllis in Holland? They are popular, but there are still people who don’t know what an amaryllis is! I tell them about the bulb with big flowers at Christmas time in their grandmother’s house. But I really think that their unique selling point is that when you buy them they are completely in bud, and then they change every day and almost quite magically, become vibrant and beautiful. Perhaps the boldest of all the amaryllis is the red variety but the wealth of colour variation for this flower is truly spectacular. Lisa van Marrewijk loves all varieties of amaryllis, but whenever a new variety is produced it goes to the top of ratings. In my house I always cut the stems short and arrange them with some foliage from the garden, but in churches and hotels they should be tall to create impact! 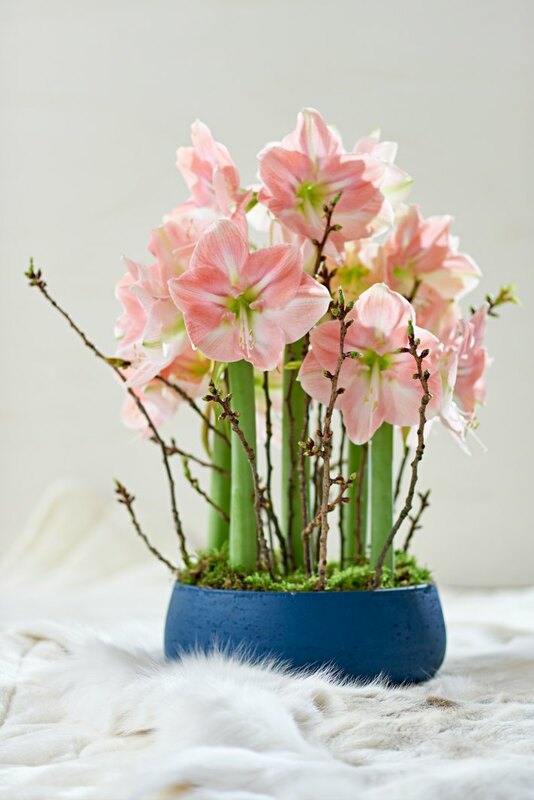 Amaryllis will open sooner in a warm environment and so to keep them lasting longer, place them in fresh, clean water. Every time you change the water, re -cut the stems. At Hybrid, it has to be said that the amaryllis can inspire some quite eccentric behaviour in our florists, who may otherwise, on the whole, be quite normal (although who wants to be normal!). 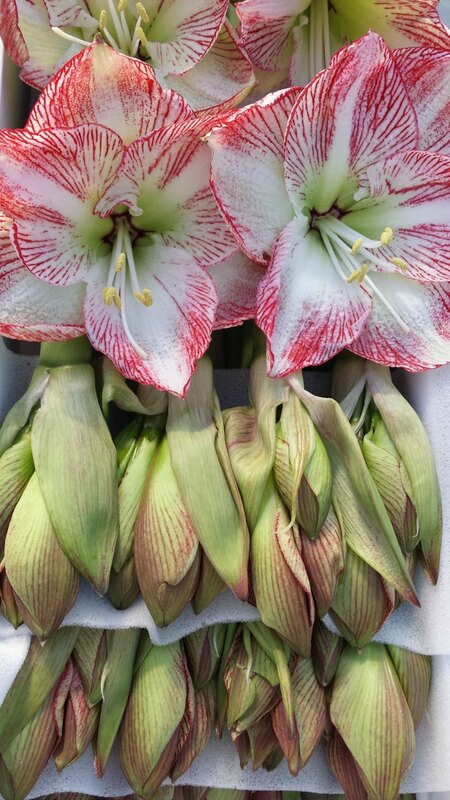 Our Creative Director, Alan, adores the satisfying echoey-crunchy sound made when an amaryllis’s hollow stem is cut. I find that painstakingly picking each individual fresh anther from the opening flower bud is just too irresistible (I like to get them just before their pollen turns yellow and dusty!). 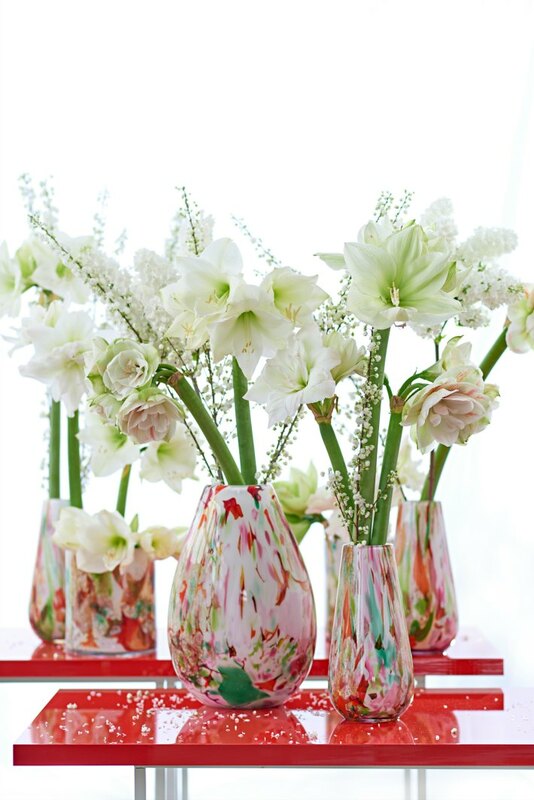 In Greece, the amaryllis symbolizes pride, determination and glamorous beauty. The story goes that a beautiful maiden, Amaryllis, fell in love with a shepherd called Alteo. Alteo was as beautiful as Apollo, and mighty as Hercules and he had a passion for flowers. He insisted he would only fall in love with a girl who could bring to him a new type of a flower, one that he had never set his eyes on before. Amaryllis was determined to bag Alteo for herself (and wouldn’t you be with those attributes?) and so she turned to the great Oracle of Delphi for advice. The Oracle told Amaryllis that in order to win Alteo‘s heart, she must wear a white dress and sacrifice her own blood for him. Amaryllis stood in front of Alteo’s house for thirty nights piercing her own heart with a golden arrow (they did things differently in those days – no I guess we’d just right-swipe?). The drops from Amaryllis’s heart fell into the soil and on the thirtieth day, a crimson flower grew where the blood had fallen. In return for this horrific, and no doubt painful, sacrifice, Alteo fell in love with Amaryllis. And maybe they all lived happily ever after! At Hybrid, we want you too to rejoice in the beauty of the amaryllis and appreciate all the possibilities it has to offer. You won’t need to sacrifice your blood either, amaryllis bulbs can be bought from most reputable florists and garden centres now. With thanks to our friends, the wonderful Marrewijk Amaryllis, amaryllisinfo.eu and Funny How Flowers Do That.